The meeting was attended by the Permanent Representatives (National Secretaries) of the Permanent Secretariat of the (PS) IGC TRACECA in the MLA member-states, representatives of the Republic of Turkey as well as the Team of the Permanent Secretariat of the IGC TRACECA. 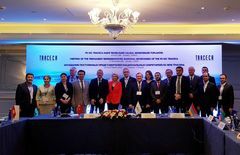 The participants of the Meeting of the TRACECA National Secretaries discussed a number of issues on the further development of the TRACECA international transport corridor. In particular, the information on realization, implementation and application of the TRACECA fundamental agreement documents and recognized it expedient to arrange internal procedures required for the TRACECA documents to enter into force. Special attention was paid to the progress of accession of the MLA Parties to the Agreement on the Development of Multimodal Transport TRACECA. The National Secretaries of the acceding Parties will take necessary measures to accelerate the internal procedures. It was also agreed that the Permanent Secretariat will finalize collecting data from the countries to complete the publication on subject guide “TRACECA Guide for Border Crossing”. 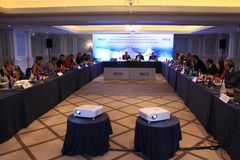 TRACECA participants discussed the progress for preparation for the Third TRACECA Investment Forum. The Romanian Party announced its willingness to hold Investment Forum in May 2019, in Constanta during the Presidency of Romania over the Council of the European Union. The Romanian Party pointed out the importance of submitting relevant regional projects. The countries already started identification of proposals for investment and technical assistance projects, including regional projects. 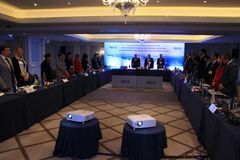 The National Secretaries of the Parties monitored the operation of the TRACECA Multilateral Permit System. Within the Meeting, the Representative of Turkish Party made presentation and shared their experience on using TRACECA multilateral permits. 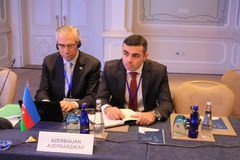 At the same time, plenipotentiary representatives of the Parties, members of TRACECA multilateral permit system (Armenia, Georgia, Moldova, Romania, Turkey and Ukraine) discussed the amendments to the Technical document. 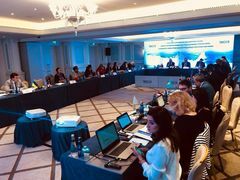 Within the discussion Turkish party states its un-readiness to increase an annual quota of permits up to 500 pieces. At the same time, the Parties also discussed the status of the implementation of the Decision and Final Resolutions of the Thirteenth Annual Meeting of the IGC TRACECA, held on 6 march 2018, in Yerevan, Republic of Armenia. The participants of the meeting also agreed to put into practice of annual TRACECA meetings the discussion of relevant issues of increasing the traffic effectiveness along the TRACECA corridor with participation of the representatives of transport undertakings, ports and customs authorities. The meeting was held in a working, constructive atmosphere with the assistance of the National Secretariat of TRACECA in the Republic of Turkey.